The system of conversion of thought into luminous radiation, which appears during thinking and concentrations in the process of use of the works of Grigori Grabovoi, for transfer of information for the purpose of normalizing control and training, is protected by patent for invention of Grigori Grabovoi “Information-Carrying System”. The patent specification mentions that “It follows from the theory of wave synthesis and laws of quantum mechanics that a thought converted into radiation can simultaneously have two quantum states” (see Grigori Grabovoi “Issledovaniya i analiz fundamentalnykh opredelenii opticheskikh system v predotvraschenii katastroph i prognozno-orientirovannom upravlenii mikroprocessami” (Grigori Grabovoi “Research and Analysis of Fundamental Definitions of Optical Systems in Prevention of Catastrophes and Forecast Oriented Control of Microprocesses”), “Electronic engineering, series 3, Microelectronics”, 1999, iss. 1 (153), p. 10). “The declared information-carrying system works in the following way. Man, who generates thought, acts as an operator (is not indicated), that transmits information.” Thus, transfer of data with the help of thought to any system has been patented out. This makes it possible to direct normalizing radiation of thought, formed by the works of Grigori Grabovoi in the field of organism and environment, into the field of eternal development and to create eternal life in this way. 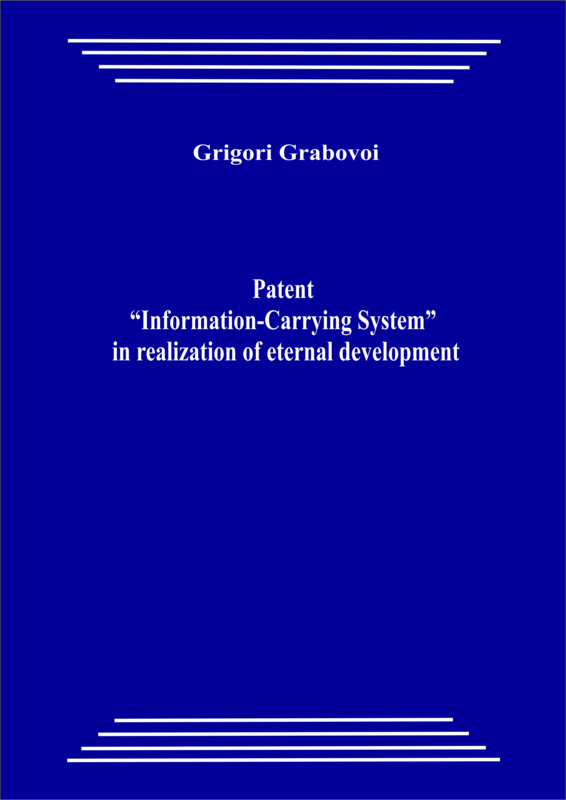 Patent specification for invention of Grigori Grabovoi “Information-Carrying System” No 2163419 of 20th February, 2001, is available in the Internet at the official site of the Federal Service of Russia for Intellectual Property, Patents and Trade Marks www1.fips.ru. 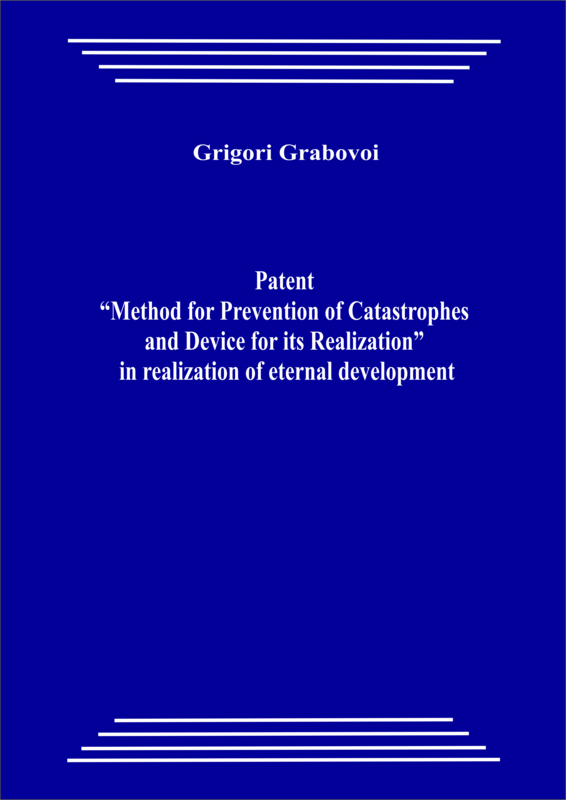 Generation by man of a normalizing biosignal, which appears with thinking and with concentrations in the process of use of works of Grigori Grabovoi, is protected as a method by patent for invention of Grigori Grabovoi “Method for Prevention of Catastrophes and Device for its Realization”. The patent specification mentions that the method of application of action “generating biosignals additionally contributes to normalization of situation in the zone of the assumed catastrophe”. The specification of the patent includes two substantiations of the method of normalization of events by means of use of normalizing biosignal: scientific, instrumental and by practical results. Thus a patent has been taken out for the method, which proves that reading and study of works of Grigori Grabovoi contributes to normalization of events of man in the direction of eternal development. Since prevention of catastrophic phenomena in the organism and in the environment by means of application of one’s consciousness, which generates biosignals by means of thinking, organizes eternal life. Patent specification “Method for Prevention of Catastrophes and Device for its Realization” No 2148845 of 10 May, 2000, is available in the Internet at the official site of the Federal Service of Russia for Intellectual Property, Patents and Trade Marks www1.fips.ru.